Oris introduced the first Big Crown in 1938. The Swiss watch manufacturer still uses this original model as the inspiration for watches in their current line, which consists of retro pilot's watches with a modern touch. 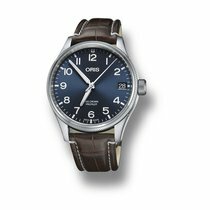 Oris has dedicated multiple collections to aviation. Watches from the Big Crown collection are direct descendants of the original legendary Oris Big Crown from 1938 in more than just name. In addition to their namesake oversized crown, most of the current models have also inherited the same unusual pointer date display as their predecessors. The simple dial with easy-to-read Arabic numerals surrounded by a fluted bezel lend these watches even more of a retro flair. 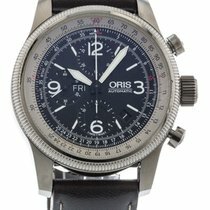 Furthermore, this collection features numerous limited editions that are reminiscent of early Oris pilot's watches and dedicated to various non-profit organizations. 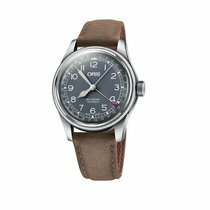 Oris introduced the pointer date display with the release of the original Big Crown in 1938. The date is displayed using a central hand rather than a window. The Big Crown Pointer Date has the same type of date display. The Oris caliber 754, based on the SW 200-1, ticks away inside the 40-mm stainless steel case. It has a 38-hour power reserve in addition to its stop-seconds mechanism and instantaneous date. Protected by double domed sapphire glass, the dial is available in either black or silvery white with the option of a guilloché finish. There is also the option of a gold plated bezel as well as various leather straps and stainless steel bracelets with or without gold plating. The Pointer Date is available in many similar variations for women. The differences are in the much smaller 29-mm case and the use of the Oris caliber 594, which is based on the ETA 2671. Plan to spend around 1,000 euros for a Big Crown Pointer Date with a dark dial and leather strap. If you prefer a light dial, gold plated bezel, and gold plated stainless steel bracelet, be prepared to pay just under 1,300 euros. Prices for women's watches start around 1,100 euros. The Big Crown Original Pointer Date is a bit more authentic and sets itself apart from the Pointer Date with its details. Both models have a 40-mm stainless steel case, an Oris 754 caliber, and a pointer date display. However, in contrast to its sister model, the Original Pointer Date has the same cathedral hands as early Oris pilot's watches, a somewhat smaller crown, and domed plexiglass instead of sapphire glass. The Big Crown Original Pointer Date also has numerous design options. Prices range from around 1,100 euros for a model with a dark dial and leather band to approximately 1,300 euros for the version with a light dial, gold plated bezel, and stainless steel bracelet. The 44-mm Big Crown Small Second Pointer Day comes with a few extra functions that are not found in its sister models. It's hard to miss the subsidiary seconds dial at 9 o'clock and the date display at 3 o'clock, but what makes this timepiece especially notable is its use of a central hand to display the day of the week. Depending on the model, the names of the days are located counterclockwise either around the edge of the dial or in the center. The central hand then points to the day. This is all made possible by the SW 220-1-based Oris 745 caliber. The Small Second Pointer Day features the same variety of designs found in other Big Crowns. This means you can choose between a black or silver-colored dial, leather or stainless steel band, and gold plating on the bezel or band. In terms of price, plan to spend around 1,000 euros for a Big Crown Small Second Pointer Day with a silver-colored dial and leather band. You will need almost 1,200 for a model with a black dial, and around 1,300 euros for a model with a stainless steel bracelet. The Oris 582 caliber, which is based on the ETA 2671, drives the 40-mm Big Crown Complication and brings with it a few interesting functions. There are subdials for the date at 9 o'clock, the day at 3 o'clock, and a 24-hour display for a second time zone at 6 o'clock. At 12 o'clock, there is a moon phase indicator – something rarely seen in a pilot's watch. These complications give the watch a very refined look, which is only enhanced by the fine guilloché dials in black or silver. 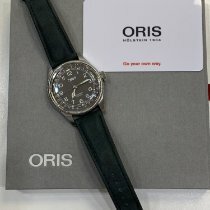 As always, Oris provides their prospective buyers with plenty of design options. The Big Crown Complication is available with a black or brown leather band, gold plated bezel, and with numerous stainless steel bracelets. Depending on the model, you'll need to set aside between 1,200 and 1,500 euros for one of these timepieces. The Big Crown 1917 Limited Edition is a recreation of the first Oris pilot's watch from 1917. Strictly speaking, the Big Crown 1917 isn't a "true" Big Crown. Regardless, its vintage look is a perfect fit for this collection. Oris stayed as close to the original as possible for the watch's design: The silvery-white dial and both hands are almost identical to those of the original. The special luminous material on the numerals and hands seems to shine from years gone by, and the Oris inscription on the dial and the company logo engraved on the stainless steel case back could have come straight from 1917. Its time setting mechanism is yet another carryover from the original and requires the wearer to press the pusher at 2 o'clock to set the time. A brown leather band with a cuff rounds off its retro feel. Unlike the 1917 original, the current version is powered by the automatic Oris 732 caliber based on a Sellita SW 200-1. It also has double domed sapphire glass with an anti-reflective coating inside and a screw-down case that makes the 40-mm case water resistant to 50 m (5 bar). A limited run of 1,917 Big Crown 1917 Limited Edition watches were produced. If you are interested in acquiring one, anticipate a cost of around 1,800 euros. The Royal Flying Doctors Service Limited Edition II is yet another limited edition of the Big Crown. It had a limited run of 2,000 pieces and is dedicated to the Australian aeromedical service, the Royal Flying Doctor Service. This non-profit has been bringing medical care to the most remote parts of the Australian continent since 1928. Accordingly, this is not only a proper pilot's watch, but is also equipped with a pulsometer scale, a very useful feature for doctors. It is located on the dial's outer ring and can be set using the bezel. Alternatively, this ring can be used to keep track of a second time zone. A day date display at 3 o'clock, double domed sapphire glass, and a screw-down stainless steel case back with an engraving of the RFDS logo complete this 45-mm watch. You can purchase one of these watches with a leather band for around 1,500 euros. If you would prefer a stainless steel bracelet, you'll need to spend just over 1,600 euros. The Big Crown D.26 286 HM-RAG Limited Edition has a limited run of 1,931 pieces. It is dedicated to the popular training aircraft Dewoitine D.26 from the 1930s and the Hangar 31 organization, which houses the last two airworthy models and hosts airshows. Fundamentally, this watch is identical to the Big Crown Original Pointer Date, but it has a green dial, double domed sapphire glass, and a screw-down stainless steel case back featuring an engraving of the D.26. The Big Crown D.26 286 HB-RAG Limited Edition comes with a vintage-style brown leather strap and costs 1,650 euros.